Old School plates are back. Due to huge demand Gym Direct have sourced these awesome old school style weight lifting plates suited for olympic bars. The 25kg & 20kg plates are the standard olympic size of Ø450mm diameter unlike most of the general purpose olympic plates on the market. 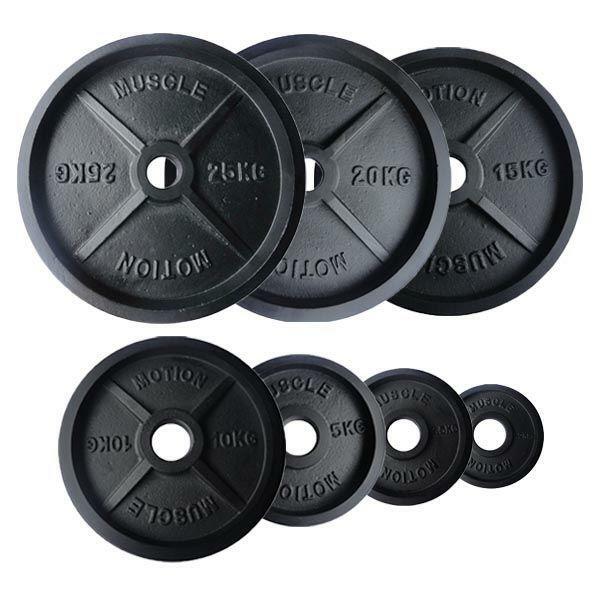 The smaller plates are nice and compact use them on any barbell machine or combine with a set of olympic dumbbells. These weight plates are machined perfectly flat so they all stack precisely on a barbell. Being thinner than most general purpose or rubber coated plates you can load up much more weight on your bar if you're a heavy lifter. Having been machined the plates are very accurate with a weight tolerance of less than 2.0% and often exactly the stated weight. Besides all the features and benefits these plates provide the simply look great in their old style matt black finish. Check out the specifications below for more information.